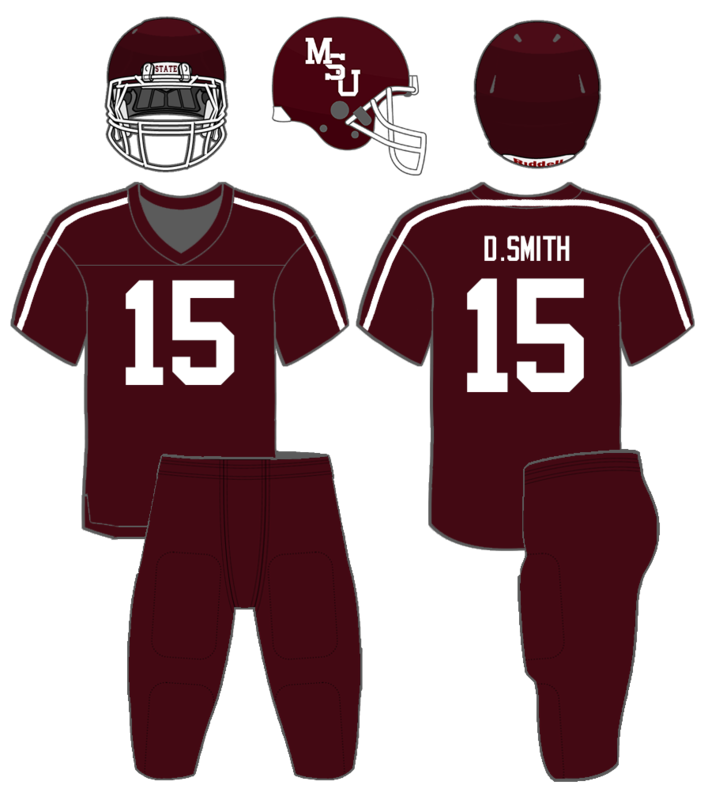 This page contains a record of every football uniform Mississippi State has worn since the 1951 season. Since switching to plastic helmets in 1949, Mississippi State has worn 41 different football helmet designs. Less than half (19) of those were worn over a 60 year span from 1949-2008. The other 22 come from the last 10 seasons (2009-2018). From 1949 through 1962, Mississippi State wore white helmets; in 1958 and 59 those white helmets had numbers on them. 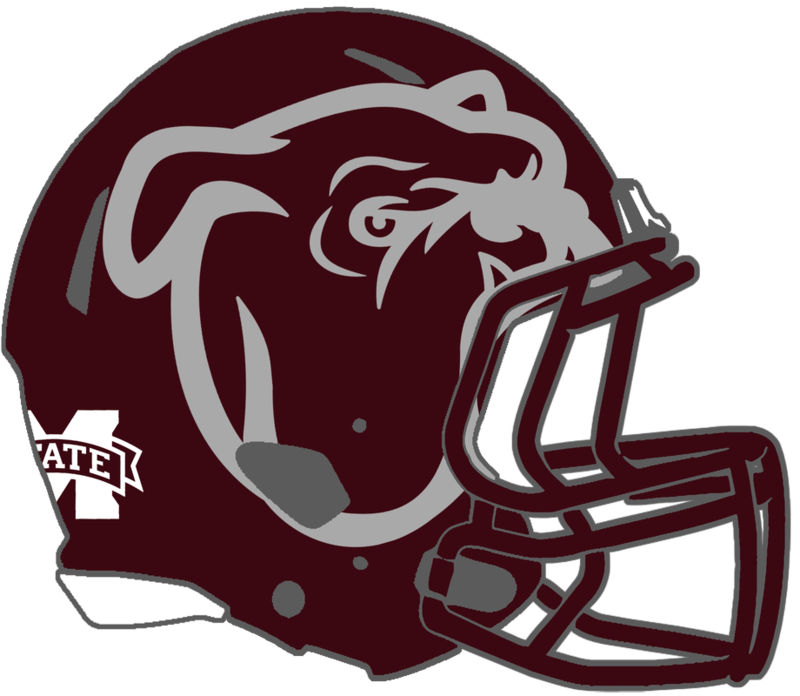 In 1963, Mississippi State wore plastic maroon helmets for the first time, wearing the Bulldog logo as a decal for the three years from 1963-1965. In 1966, the "Flying M" logo was worn on maroon helmets. In 1967, the Bulldogs switched back to white helmets, wearing numbers in 67, 68, and 72, and the "Flying M" from 69-71. 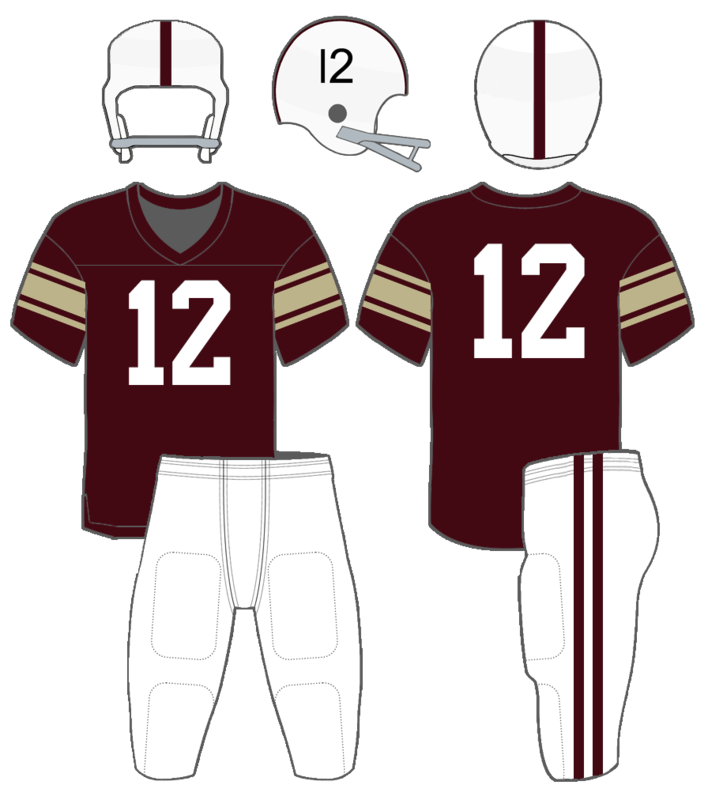 In 1973, the switch was made back to maroon helmets. 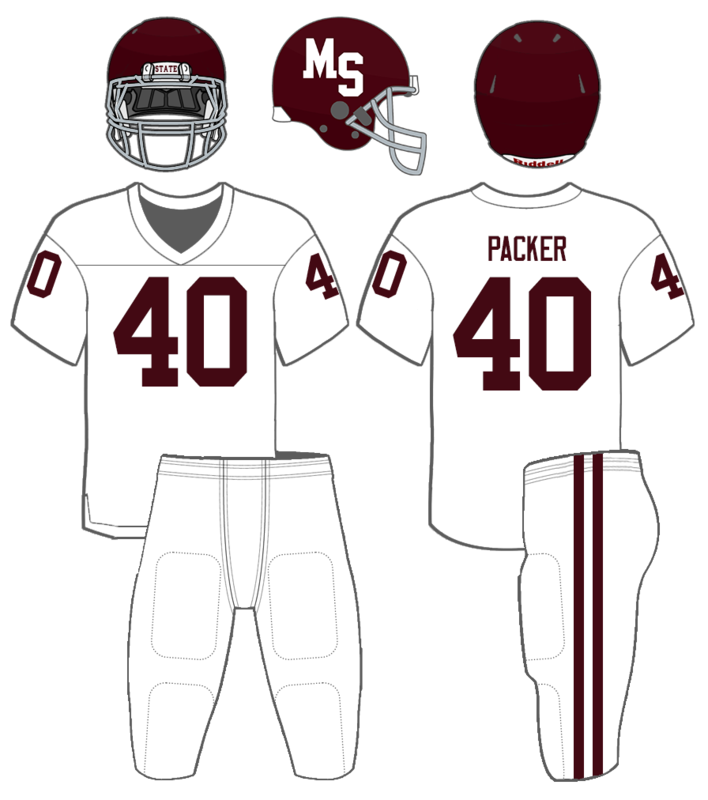 An "MS" logo was worn until 1978, with the facemasks switching to white that year. 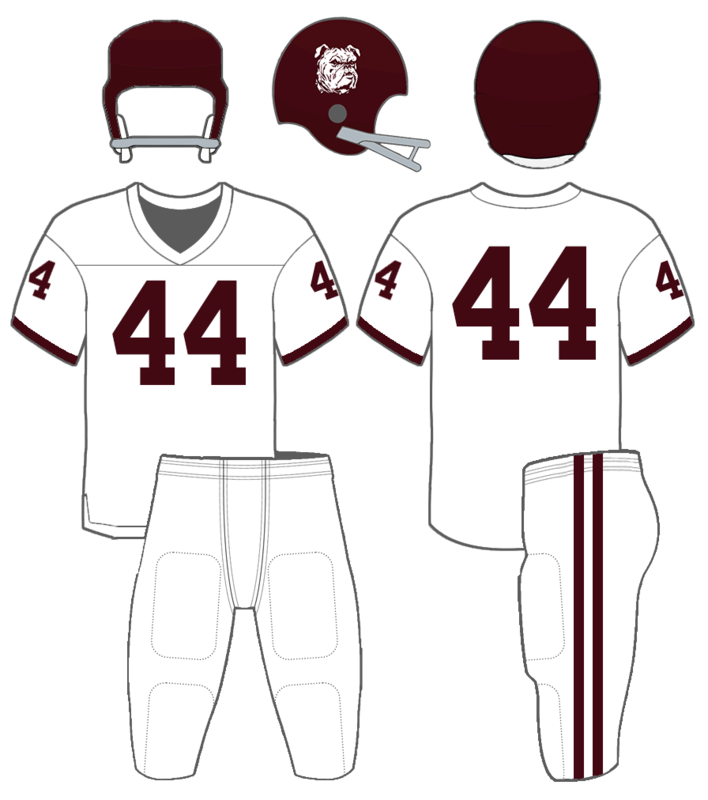 In 1979, the logo was changed to an interlocking "MSU". Stripes were added and the "MSU" logo was altered in 1986. The stripes were removed in 1989 and the logo was altered again in 1996. 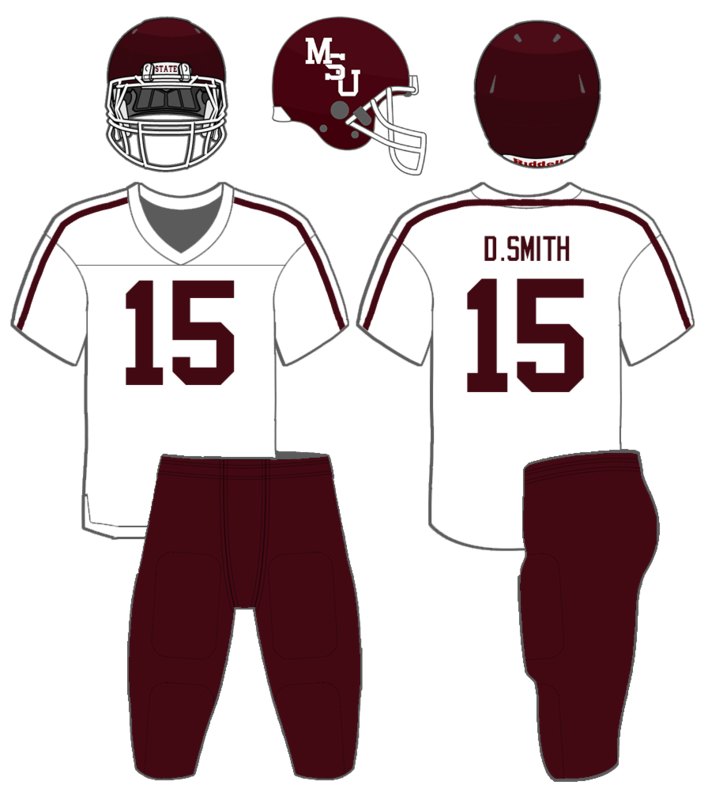 Starting in 2000, Mississippi State began wearing white helmets as alternates. 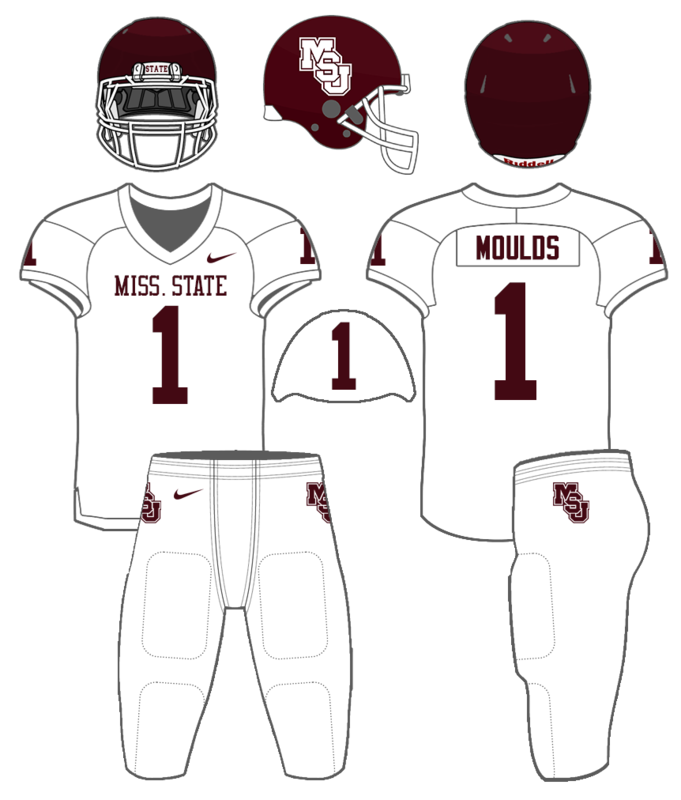 In 2004, white helmets became full-time for the first time since 1972, this time featuring the "M-State" logo. 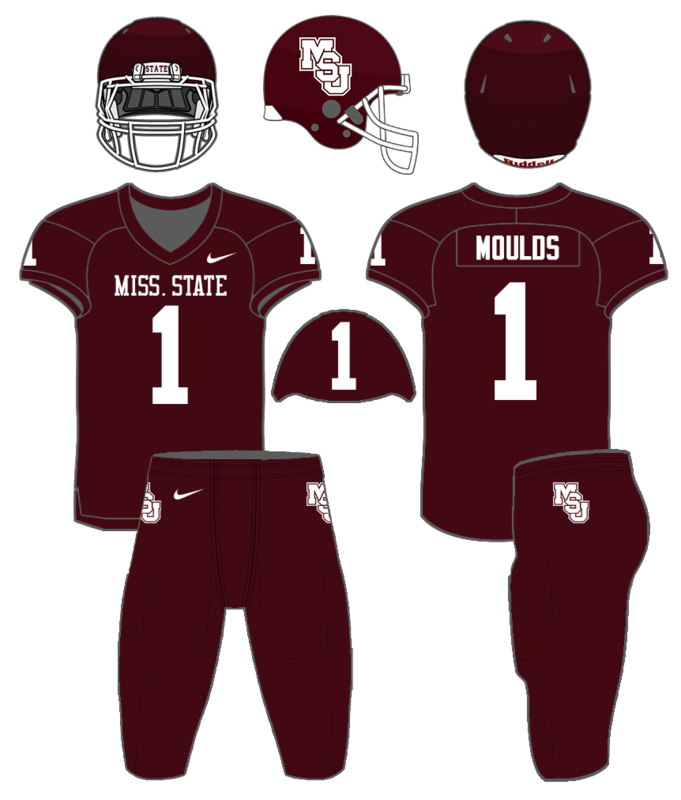 In 2009, maroon helmets became the primaries once again, featuring the updated "M-State" logo. Starting in 2011, the Bulldogs began wearing multiple alternate helmets each season, with features such as matte maroon, white, silver, and even chrome gold. ​We start in 1951, when State had a bit of a mix and match going. 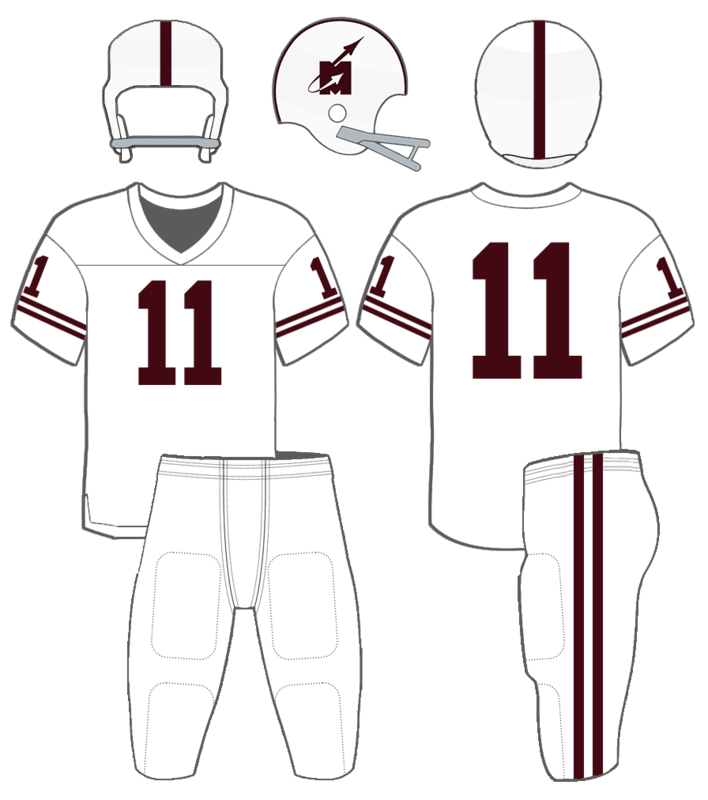 They had plain white helmets with a maroon stripe, plain maroon and white jerseys, and white and maroon pants, each with a single stripe. 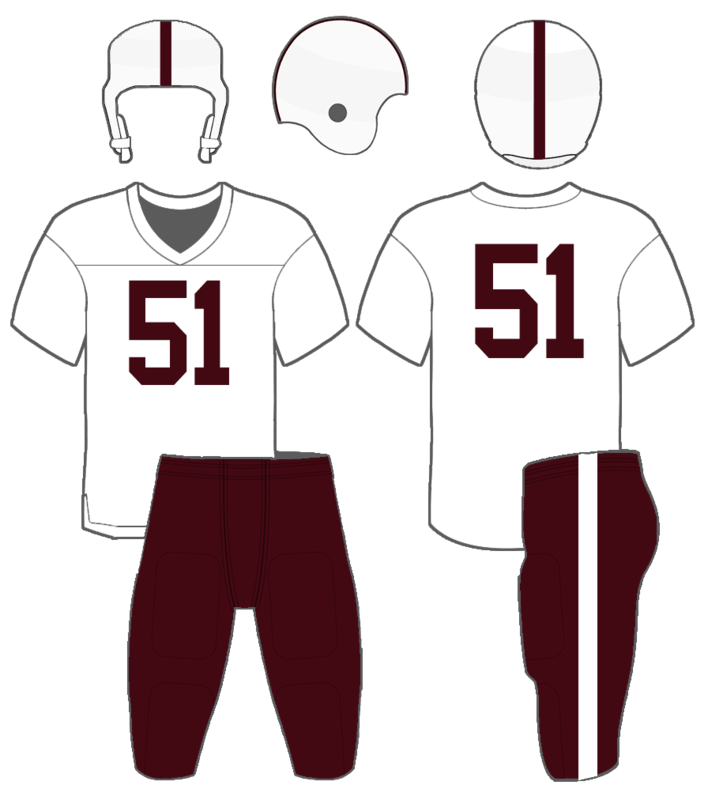 Pictures from 1951 confirm that they at least wore the Maroon-Maroon, Maroon-White, and White-Maroon combinations. They kept the same set in 1952, but I couldn't confirm if they did the same level of mixing and matching that year. In 1953, the stripes on the pants were doubled. The latest photos I saw of the maroon pants being worn, outside of freshman games, were in 1953. 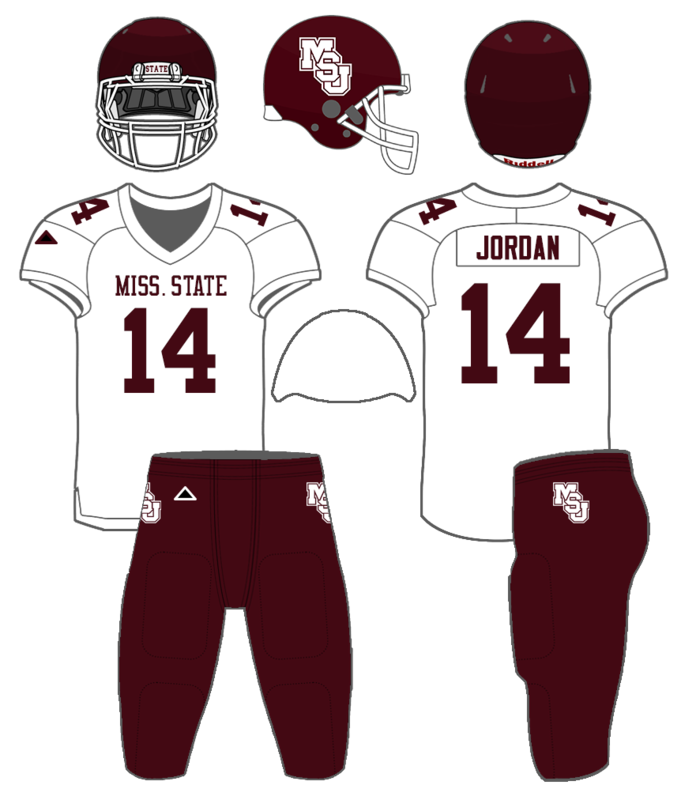 State wouldn't wear maroon pants again until 1984. 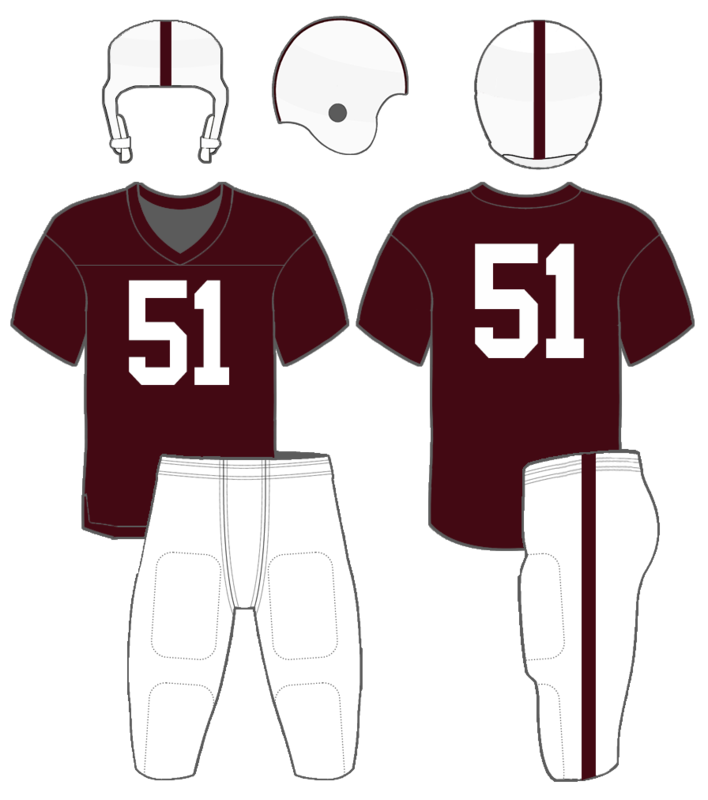 In 1958 and 59, State added black numbers to the helmet and "northwestern" stripes to the sleeves. I'm not sure exactly what color the stripes were on the maroon jersey, but they weren't white. In 1960 through 1962, the Bulldogs removed the helmet numbers and actually wore Ole Miss-like double vertical shoulder stripes on the jerseys. Maroon helmets were worn for the first time in the plastic helmet era in 1963. 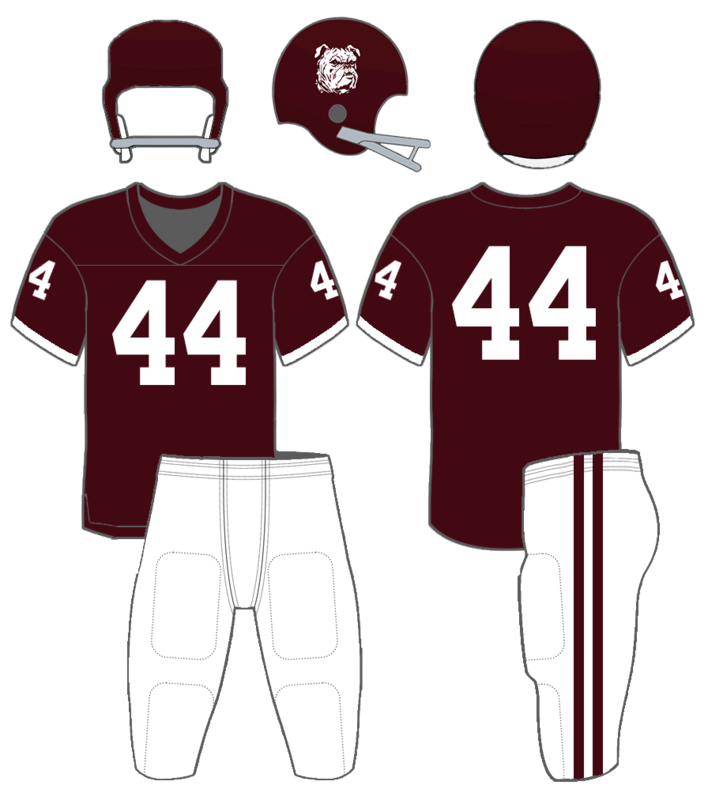 The original maroon helmets featured a bulldog logo; the jerseys during this time were stripeless aside from a contrasting cuff. In 1966, the helmet logo was changed to the "flying M."
The switch was made back to white helmets in 1967; these were stripeless with numbers on the side for two seasons, though a different number font was used each season (67,68). The jerseys featured thin double stripes on the sleeves, mirroring the pants. ​From 1969 to 1971, the Bulldogs wore the classic "flying M" look. A maroon stripe and the "flying M" logo were added to the white helmets, and numbers were added above the sleeve stripes on the jerseys. In 1972, the "flying M" logo was replaced by numbers on the side of the helmet; on the jersey, the sleeve stripes and numbers were removed. 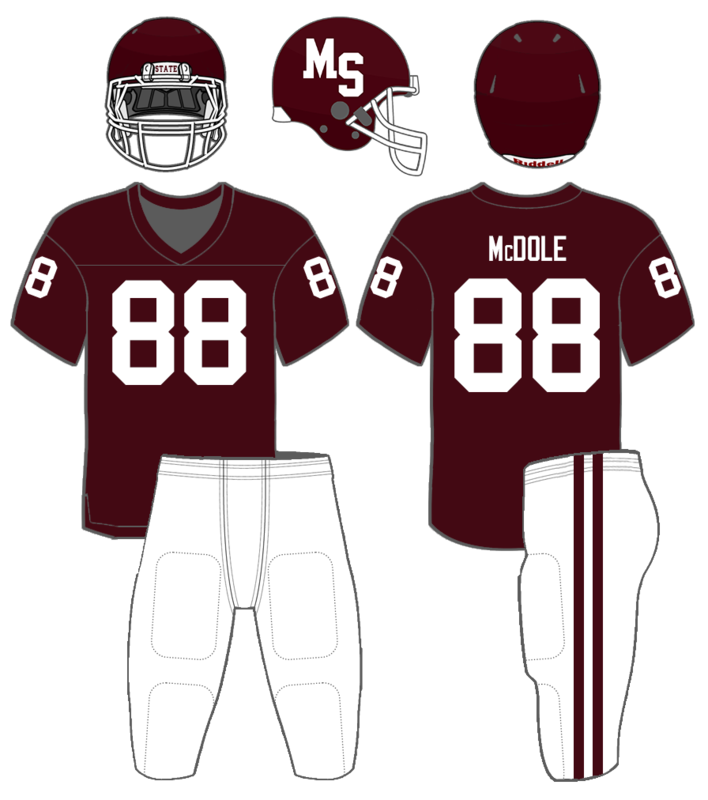 In 1973, maroon helmets were re-introduced, featuring an "MS" logo and a gray facemask. Sleeve numbers were also brought back in 1973. The facemask on the maroon helmets was changed from gray to white for the 1978 season. 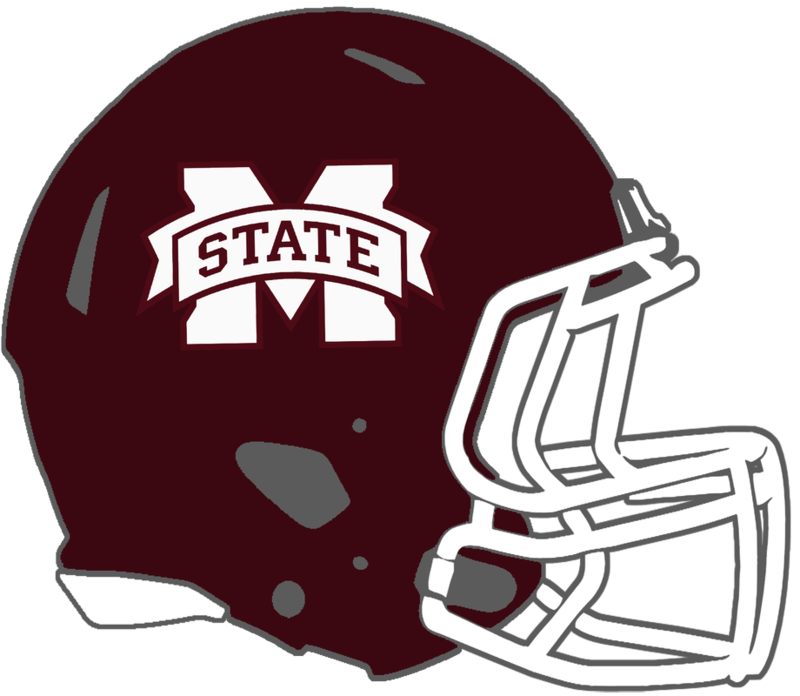 In 1979, the "MS" logo on the helmet was changed to a full, interlocking "MSU". 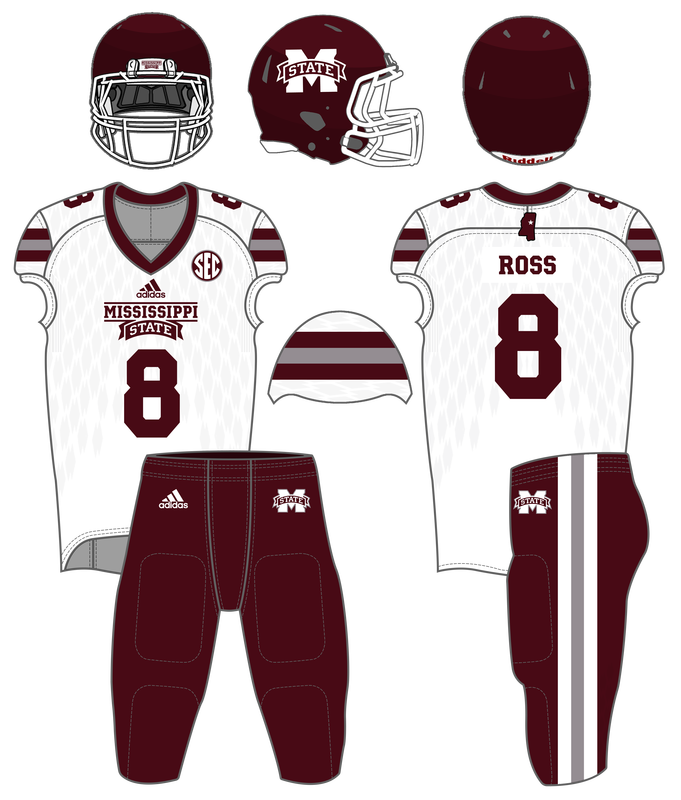 For more in-depth details about what uniforms Mississippi State wore in each game from 1980-1989, click here. Former QB Rocky Felker became head coach of the Bulldogs in 1986, coinciding with one of the most significant uniform changes in program history. The 1986 uniforms added an updated "interlocking MSU” logo to the helmets and introduced silver/gray to the color scheme. Silver and white stripes were added on the helmets and jersey sleeves. Silver pants with maroon-white-maroon stripes were the primary pants option; they were only option in 1986- white pants were re-introduced in 1987 and 1988 as an alternate option. An update in 1989 removed the shoulder stripes, helmet stripes, and all silver from the uniforms, resulting in a plain look very similar to the 1979-1983 look, as well at what would be worn from 2004-2008 (white helmets and maroon pants aside). 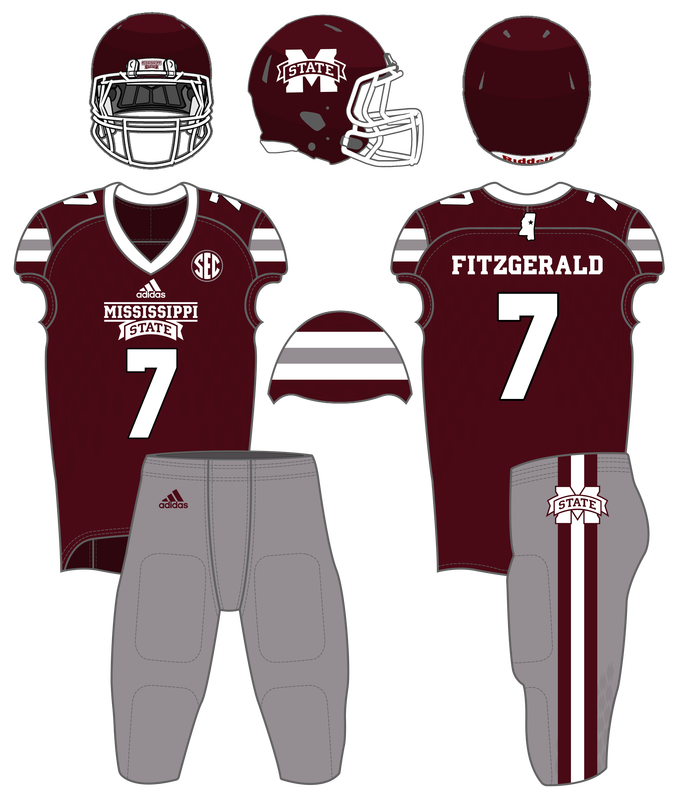 For more in-depth details about what uniforms Mississippi State wore in each game from 1990-1999, click here. In 1991, "Miss. 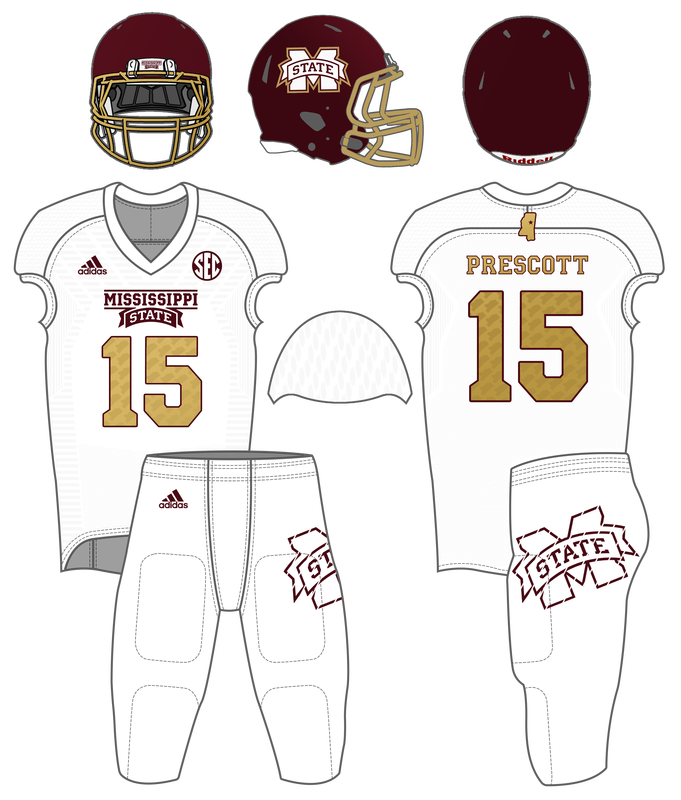 State" was added to the front of the jersey. 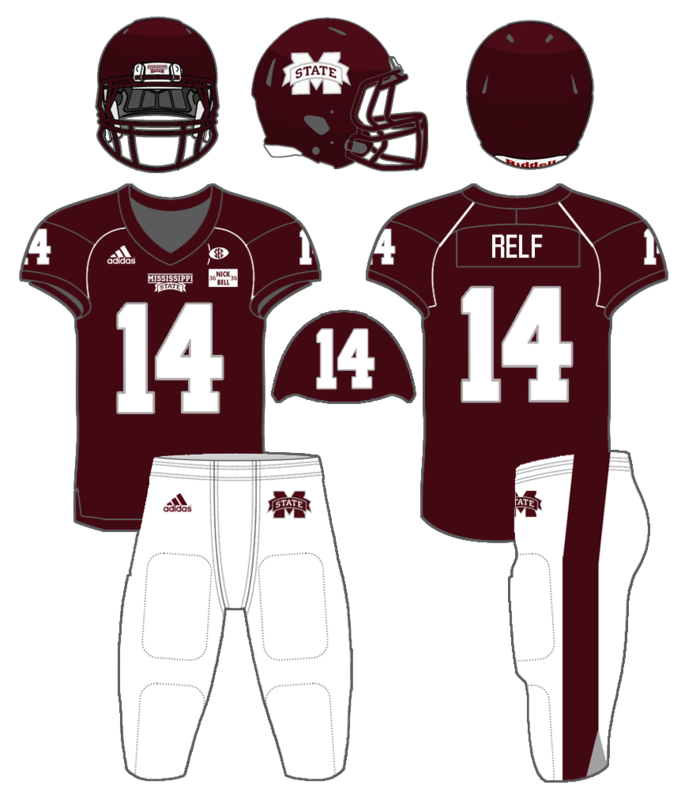 Pants stripes were dropped, but the “MSU” logo was added to the hip. TV numbers were moved to the top of the shoulder. 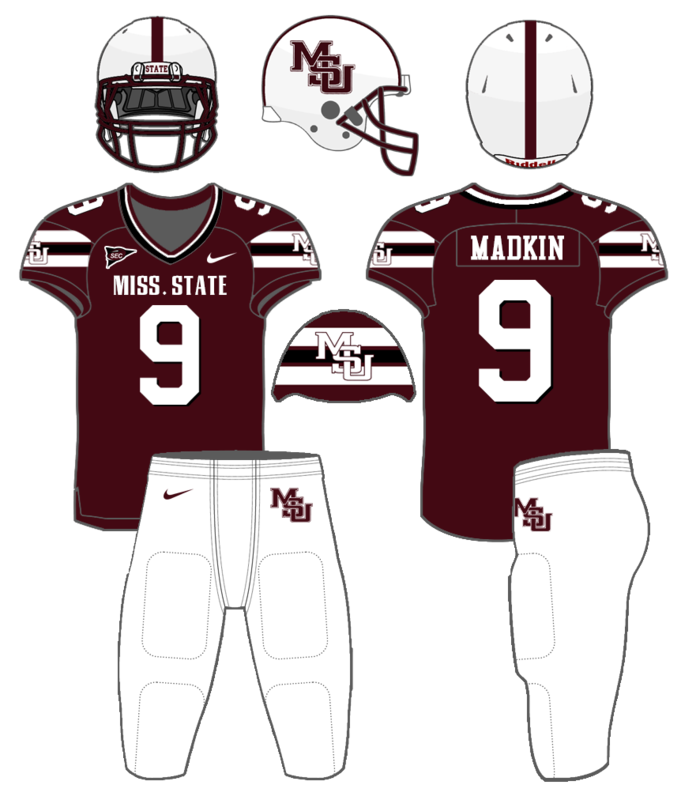 ​Maroon pants were added for the Peach Bowl at the end of the 1992 season, and continued to be worn every now and then in the following years. The 1995 season was the first that the Bulldogs played under Nike. ​The first year Nike uniforms were very similar to the previous set; the only changes were the addition of the swoosh and the movement of the TV numbers back to the sleeve. 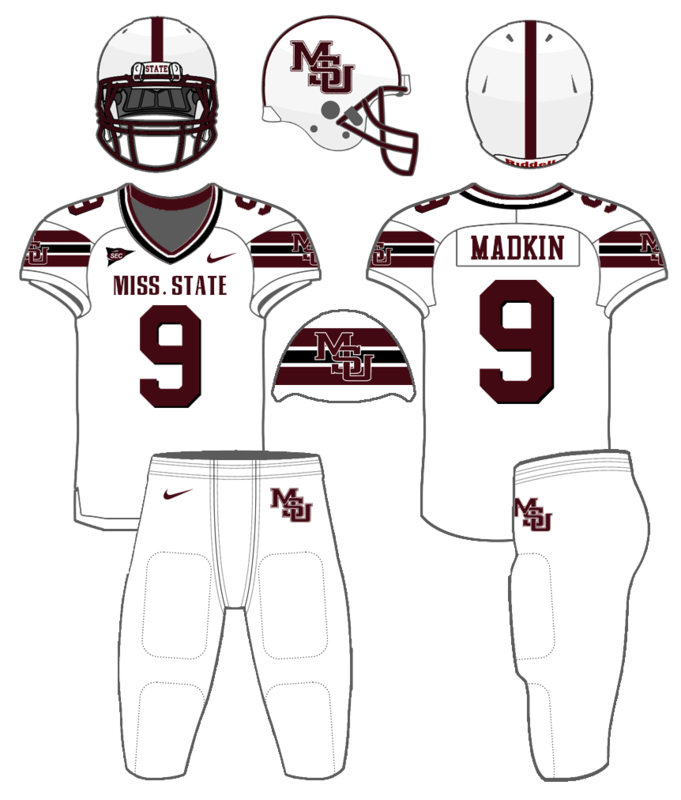 The 1996 update was the biggest change yet for the Bulldogs; the new Nike uniform set included black drop shadows on the numbers, white and black stripes on the shoulders, and an updated “interlocking MSU” logo on the helmet. For more in-depth details about what uniforms Mississippi State wore in each game from 2000-2009, click here. After being debuted in 2000 Independence Bowl (or "Snow Bowl"), white helmets with the "interlocking MSU" logo were worn as alternates in 2001 and 2002. 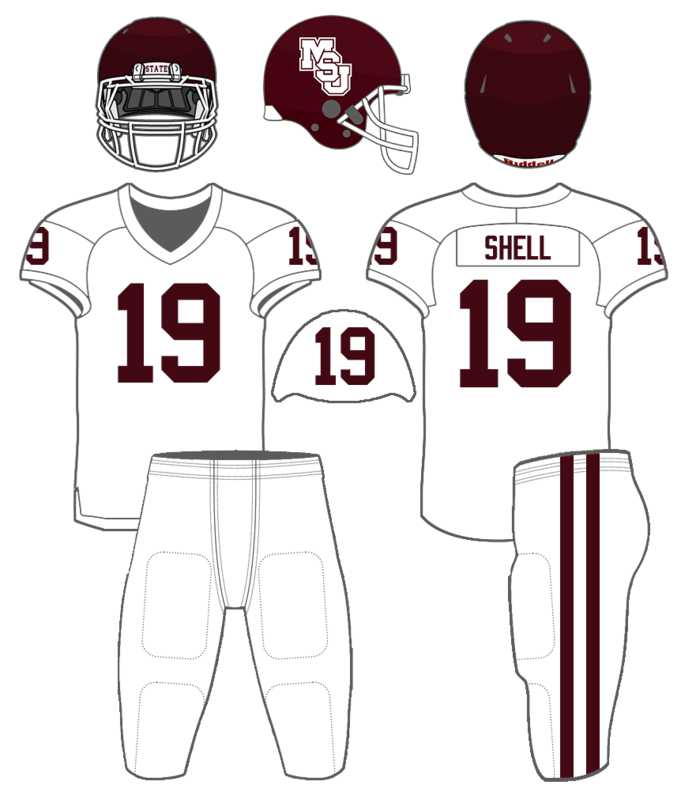 State wore the white helmets once in 2003; they were worn with numbers on the side in the 2003 Egg Bowl, which was Jackie Sherill's last game as Head Coach. State changed manufacturers in 2004, from Nike to Russell. 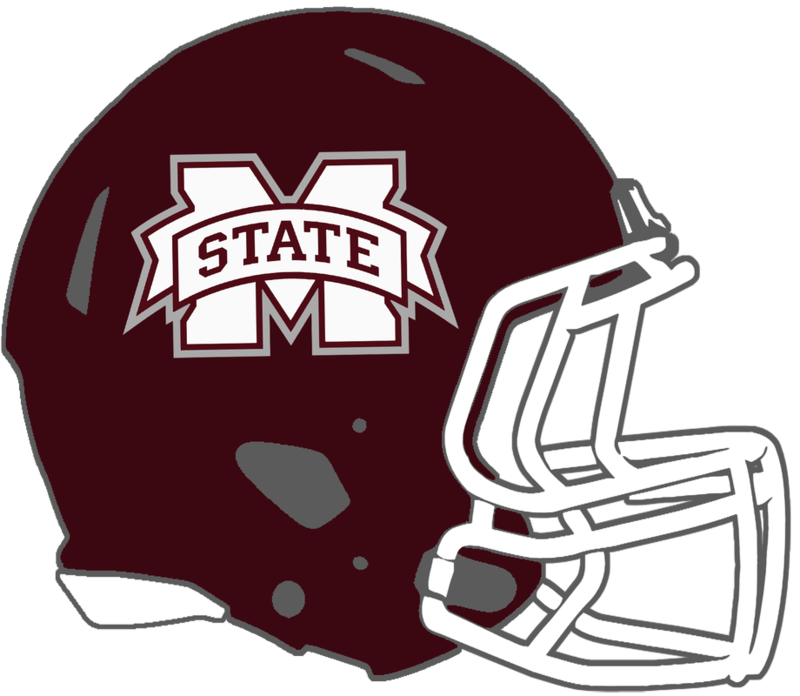 Due to Nike owning the updated "interlocking MSU” logo and Mississippi State's administration wanting to create a more unified brand, the "M-State" logo became the helmet logo and white helmets became the full-time look for the first time since 1972. ​Along with the white helmets, the Russell Athletic uniforms were very plain; the jersey featured no stripes and the pants featured a generic double stripe. Only white pants were worn in 2004 and 2005; maroon pants were added in 2006 to create a not-so-fan-favorite all maroon look. In the 2008 home game against Kentucky, Mississippi State wore pink breast cancer awareness ribbons behind the "M-State" logo on their helmet decals. 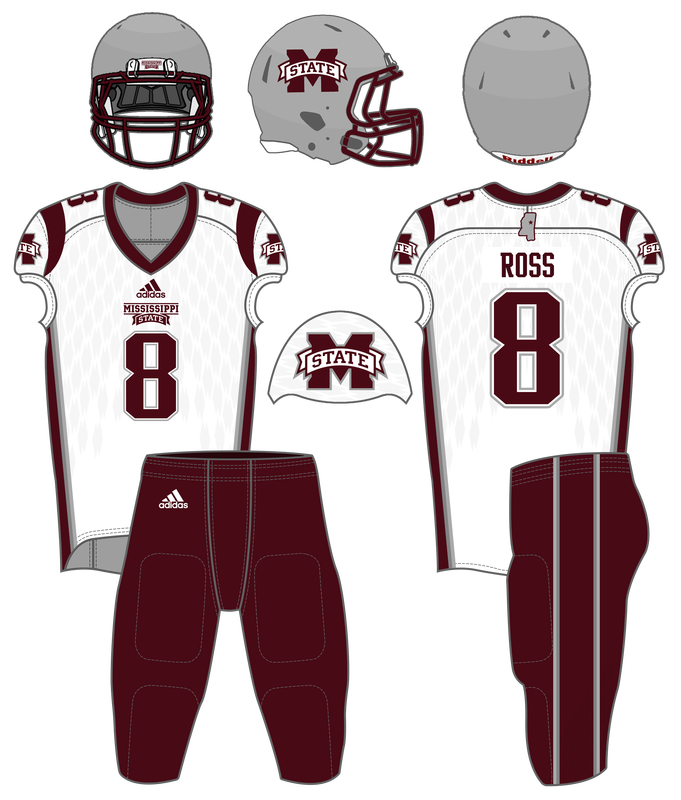 During the offseason prior to the 2009 season, the university underwent a rebrand, updating the “M-State” logo, adding new Bulldog logos, a new wordmark logo, and a new manufacturing agreement with Adidas. 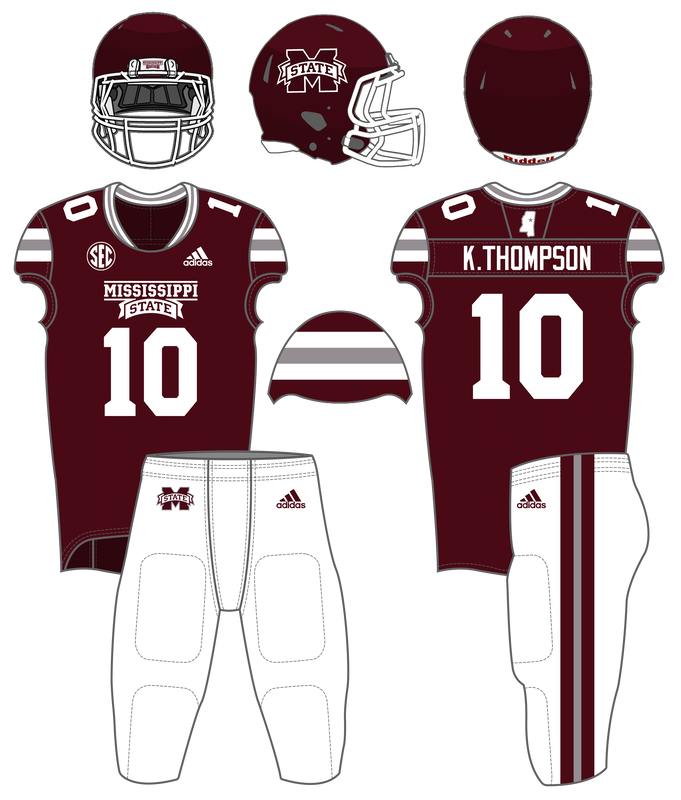 Coinciding with the start of the Dan Mullen Era, the new Adidas uniforms brought back maroon helmets, added a small wordmark and piping to the chest, and replaced the double pants stripes with a wide stripe on the white pants and no stripes on the maroon pants. 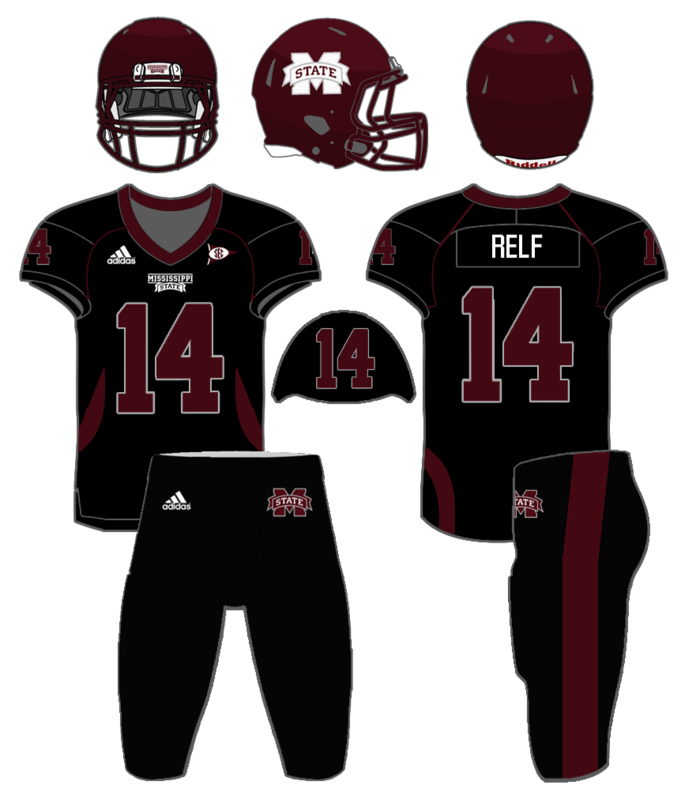 During the 2009 season, Mississippi State wore black jerseys for the first time in school history. 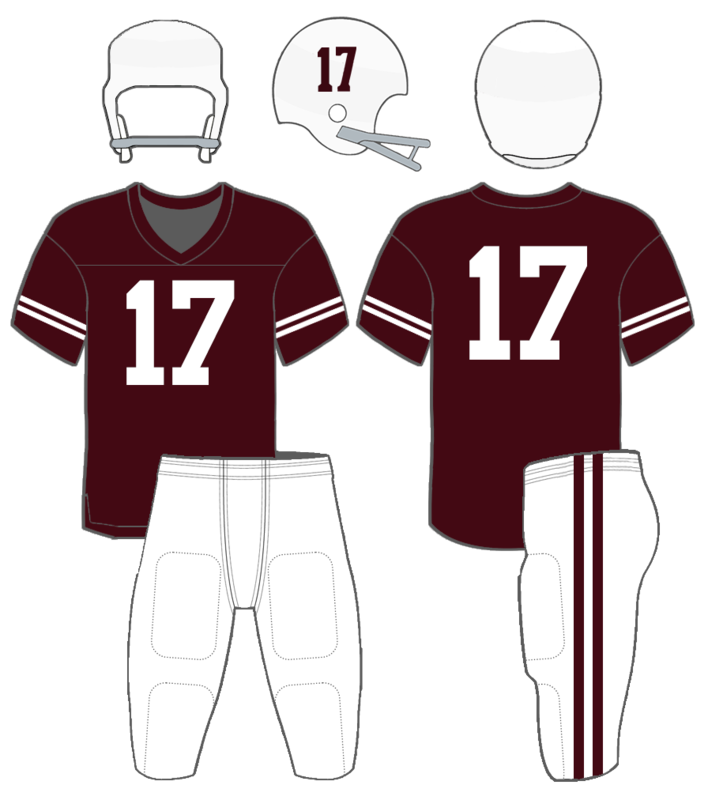 Worn in the 09, 10, and 11, the first black jerseys in school history followed the same template as the maroon and white jerseys, with a white wordmark but maroon numbers. In 2010, they were worn with black pants to create an all-black look. 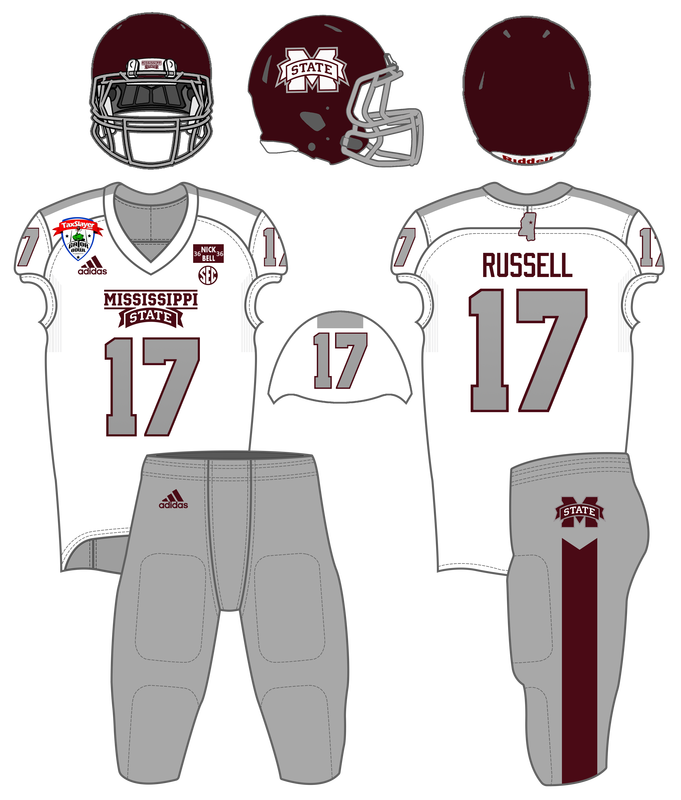 For more in-depth details about what uniforms Mississippi State wore in each game from 2010-2017, click here. 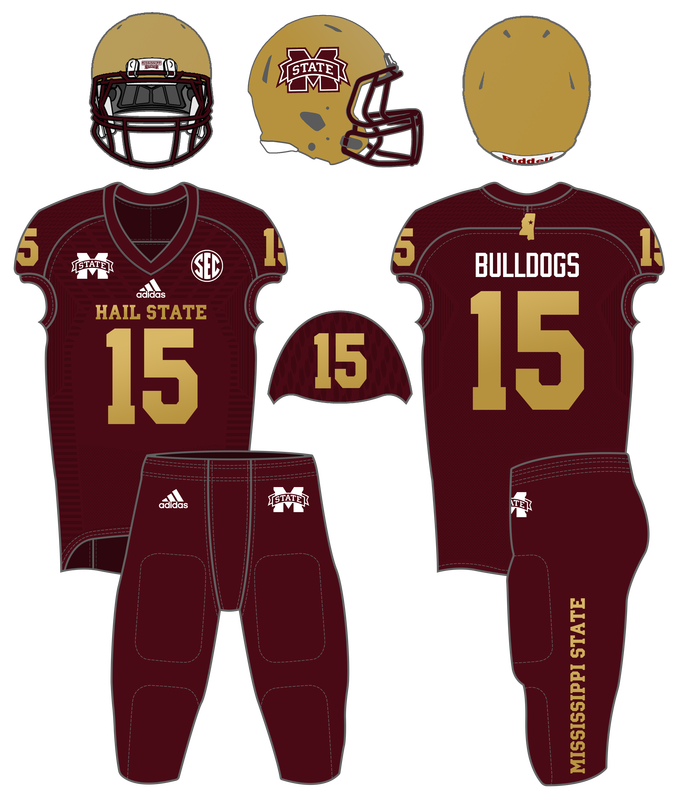 Mississippi State wore special, gold-accented uniforms in four Egg Bowls, staring in 2011 and going through 2014. 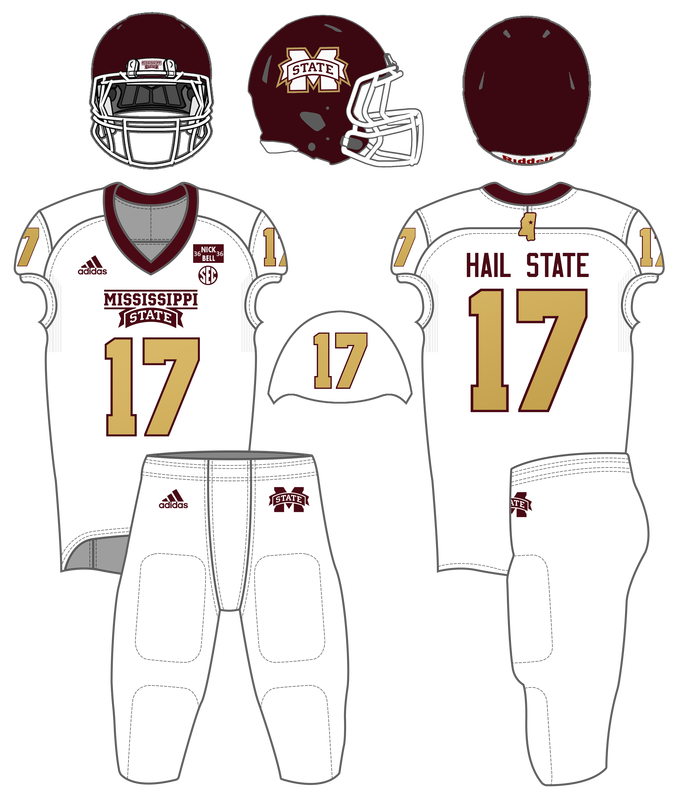 The 2011 Egg Bowl uniform was Mississippi State's first true alternate uniform- it featured gold numbers, a new state of MS logo on the sleeves, and gold outlines on logos throughout the uniform. The 2012 uniform was essentially a white version of the 2011 one, but with a matte helmet and sleeve numbers. 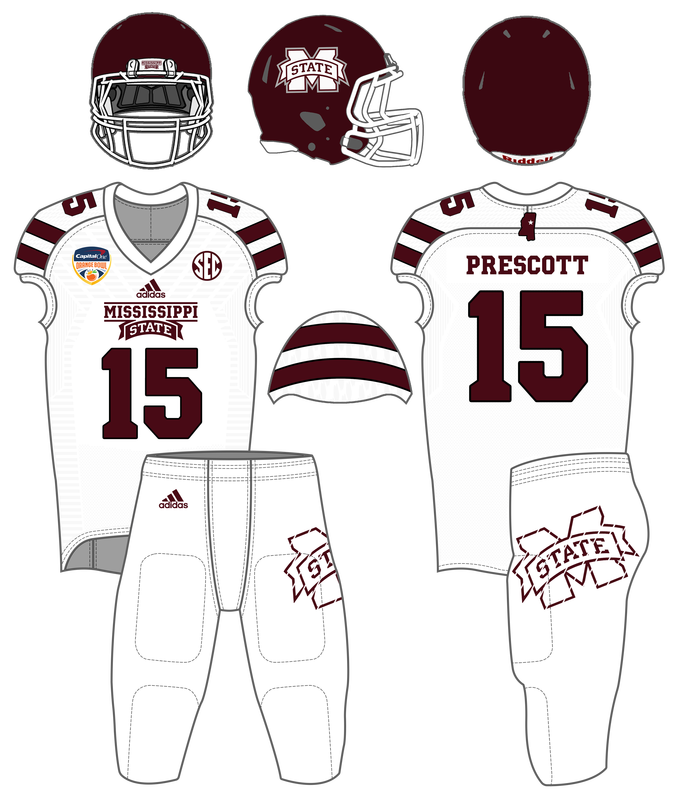 The 2013 Egg Bowl uniform was the most outlandish yet, with chrome gold helmets, no white outline on the numbers, and "Hail State" on the chest. 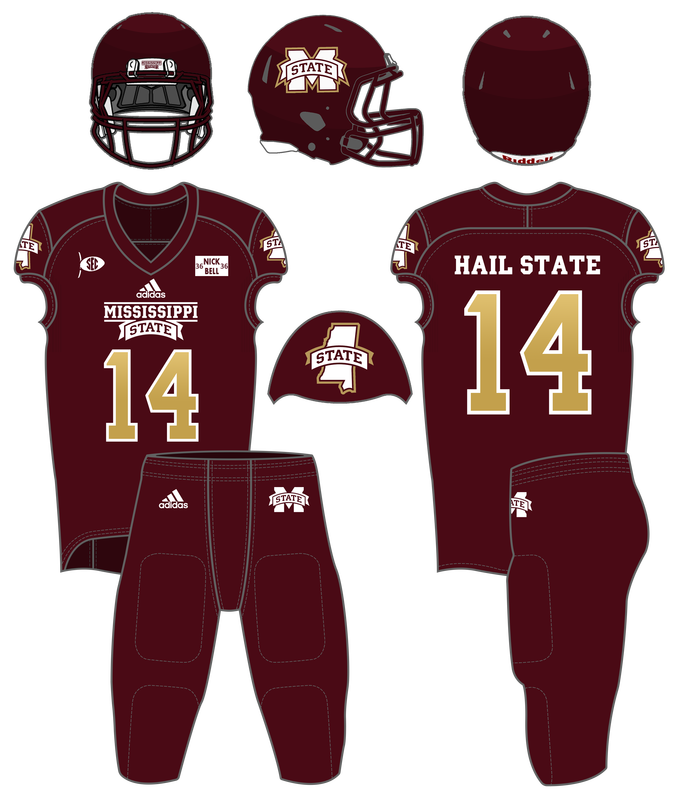 The 2014 version was more conservative, with a maroon helmet, gold facemask, a State of MS texture in the gold numbers, and the DWS 100 pants. 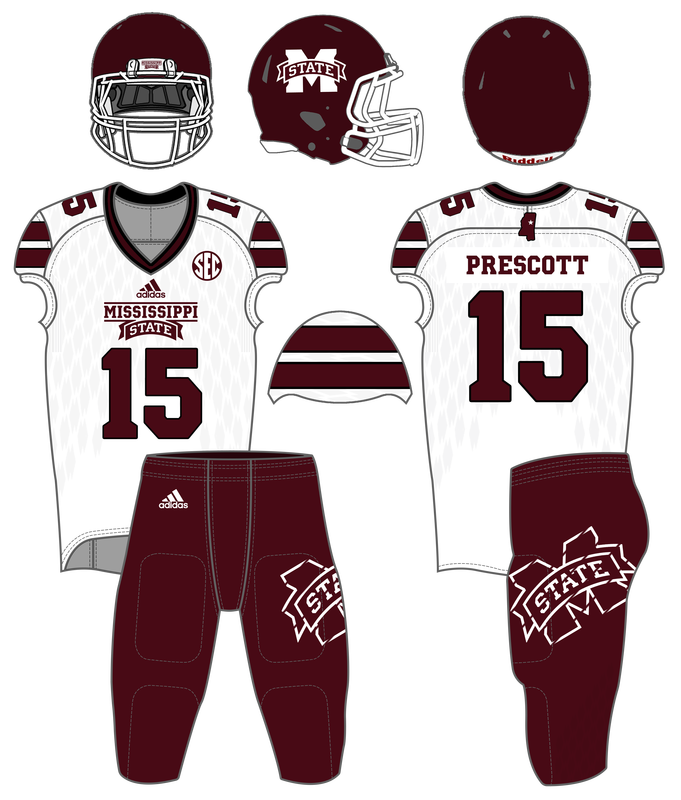 In 2015, the Bulldogs went back to simple maroon and white for Egg Bowls; they finished with a 2-2 record in special Egg Bowl uniforms. Both wins came in the home maroon versions and both losses came in the road white versions. 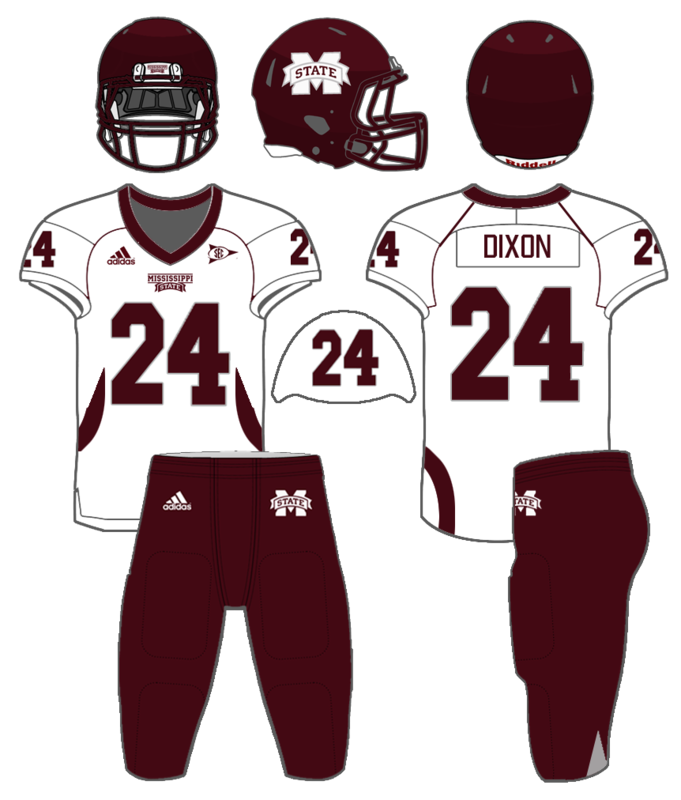 The 4 different helmet designs worn during the 2011 season were by far the most Mississippi State had ever worn in a single season at that point. Though the uniforms remained the same as 2009-10, the primary helmet design was altered and an alternate matte helmet design was added. 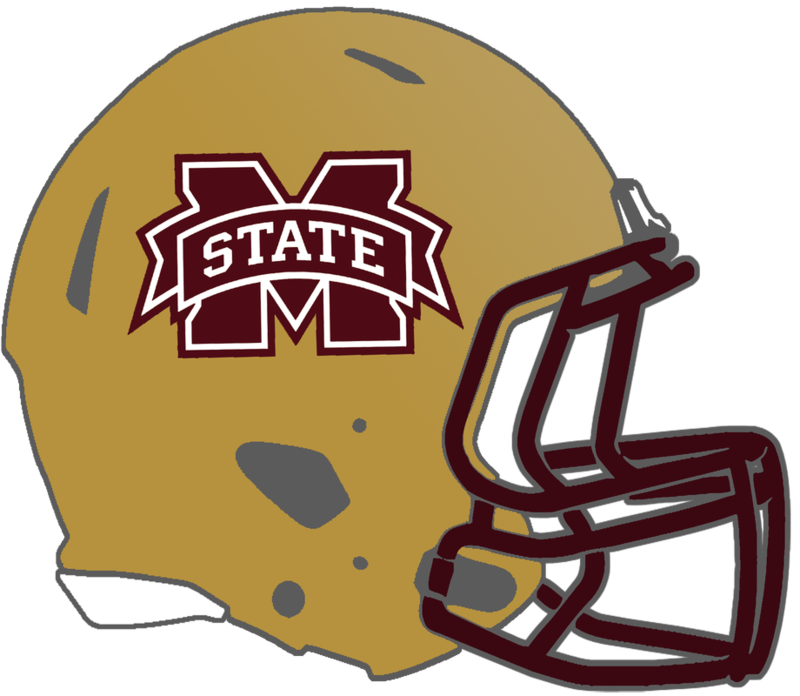 For the 2011 Egg Bowl, a gold outline was added to the logo on the glossy helmet. For the Music City Bowl, a gray outline was added to the logo on the matte helmet, bringing the helmet design total to 4 for the 2011 season. 2011 was only the start of the alternate helmet craze for Mississippi State; the Bulldogs would go on to wear 5 helmet designs in 2012, 4 in 2013, 5 in 2014, 4 in 2015, and 3 in 2016/2017. 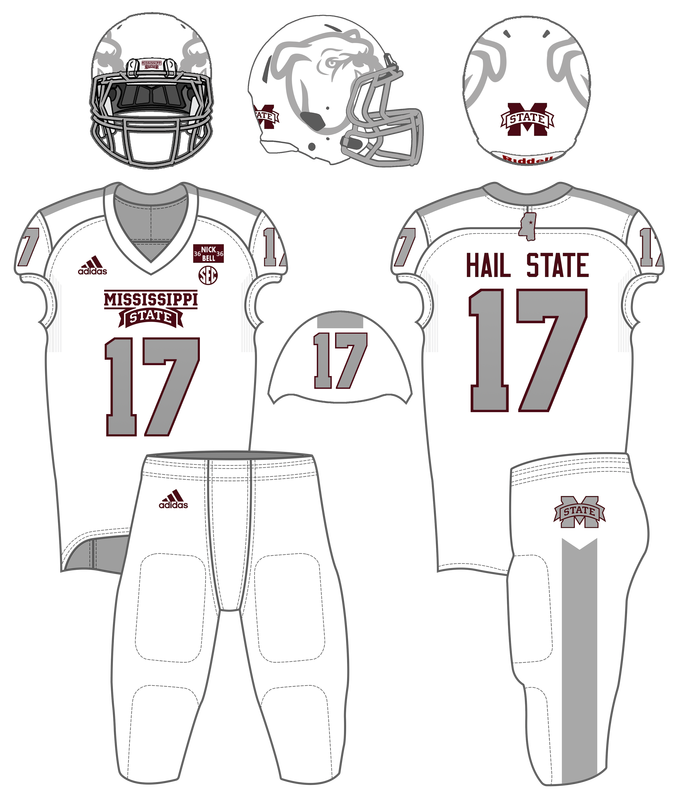 Adidas redesigned the uniforms for the 2012 season, with the Bulldogs getting upgraded to the TechFit template full time. 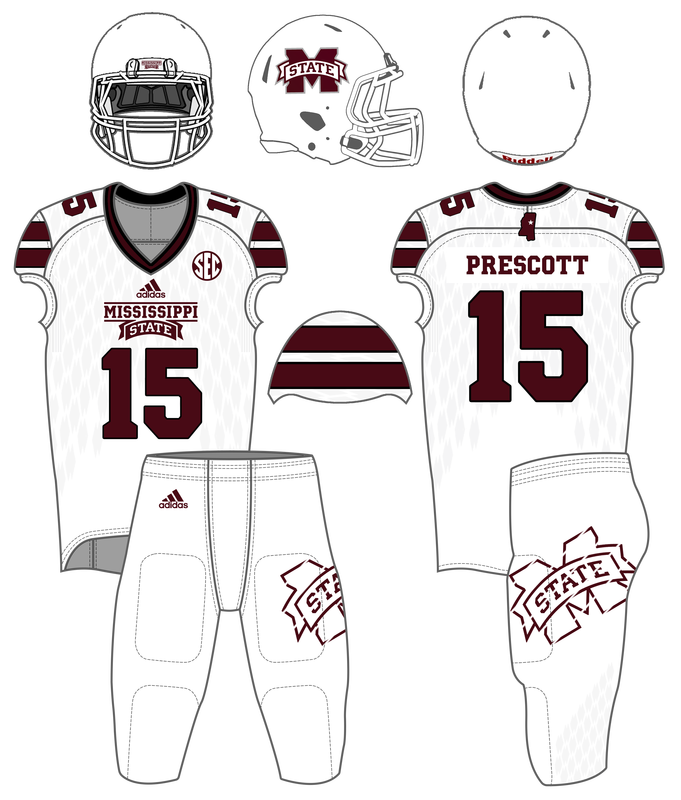 The new uniforms featured a ribbon design mimicking the one on the "M-State" logo thought; the ribbon was featured on the pants, helmet, and undershirt stripes, but not on the shoulder stripe. 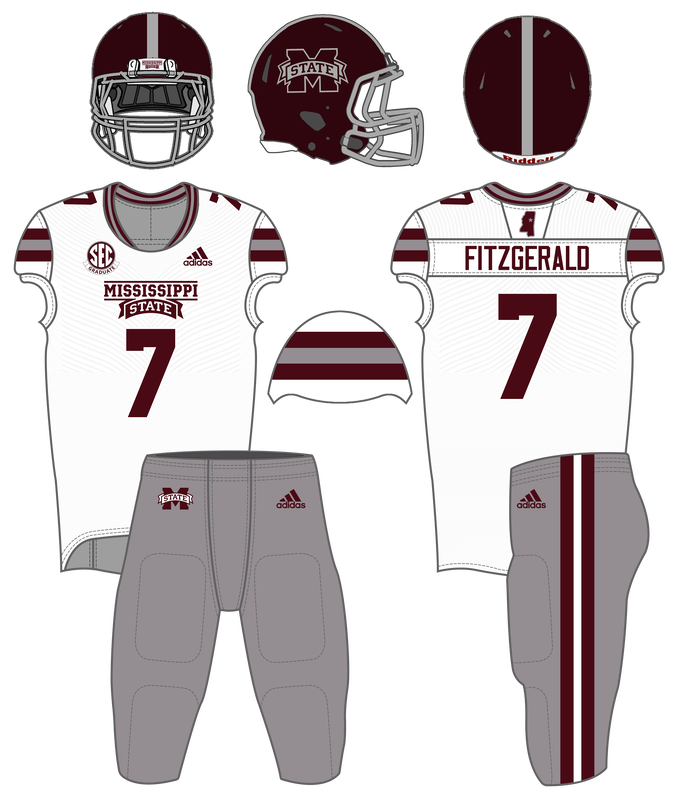 The Mississippi State wordmark on the chest was enlarged; gray pants were included in the set for the first time since 1988. 2012 was also the first year for Texas A&M, whom MSU beat in the “Snow Bowl” 12 years earlier, to play in the SEC. 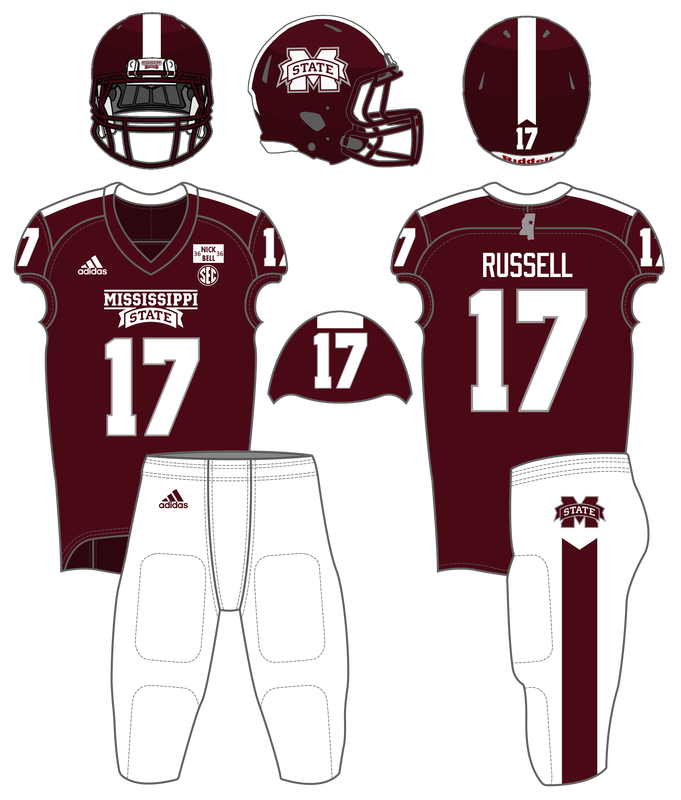 Adidas designed special uniforms for the Bulldogs to wear against the Aggies in their first meeting as conference foes. The "Snow Bowl" jerseys were re-purposed and worn with gray pants and the matte maroon helmet (with a silver facemask) in the Gator Bowl later that season. 2013 saw the addition of two brand new helmet designs. A maroon version of the Snow Bowl helmet was worn against Oklahoma State in the 2013 Texas Kickoff Classic and again against Kentucky. For the 2013 Egg Bowl, a chrome gold helmet was introduced. In 2014, to commemorate the 100th anniversary of Davis Wade Stadium, as well as the opening of the new expansion, the Bulldogs unveiled throwback uniforms. Resembling the unis worn from 1996 to 2003, the maroon jersey featured white sleeve stripes with a black outline and a white numbers with a black outline. The helmet was maroon with a white facemask. The biggest difference between the 90's unis and these throwbacks is the absence of the interlocking "MSU" logo and the presence of the "MState" logo. 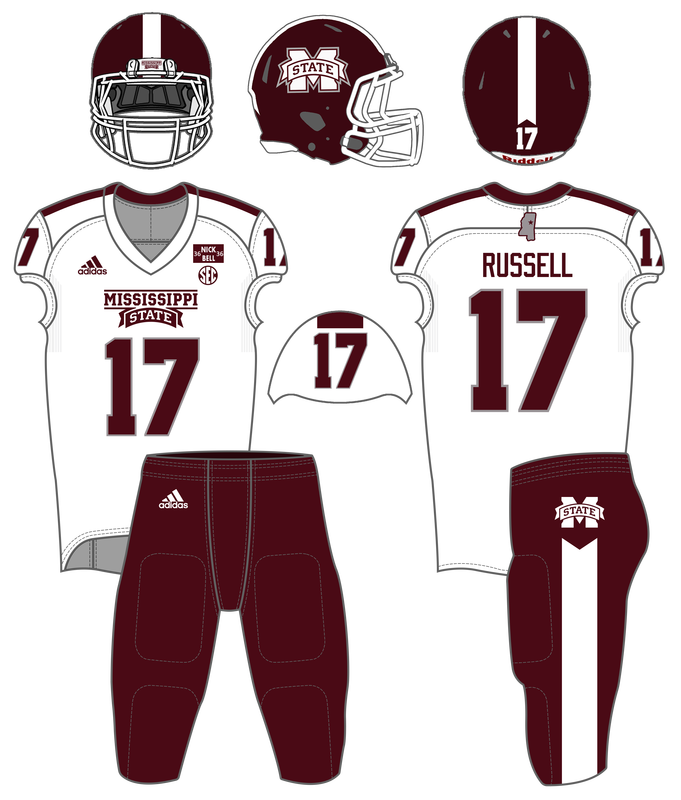 Originally worn vs Southern Miss, these became the go-to uniforms in 2014 after the Bulldogs wore them in back-to-back-to-back victories over top-10 teams (LSU, Texas A&M, and Auburn). The Bulldogs finished the 2014 season 6-0 in these uniforms. A white version was unveiled for the 2014 Orange Bowl. It was worn with a matte maroon helmet that had the exact same design as the helmet worn in the Music City Bowl three years prior. In 2015, the DWS 100 uniform design was carried over to full time. 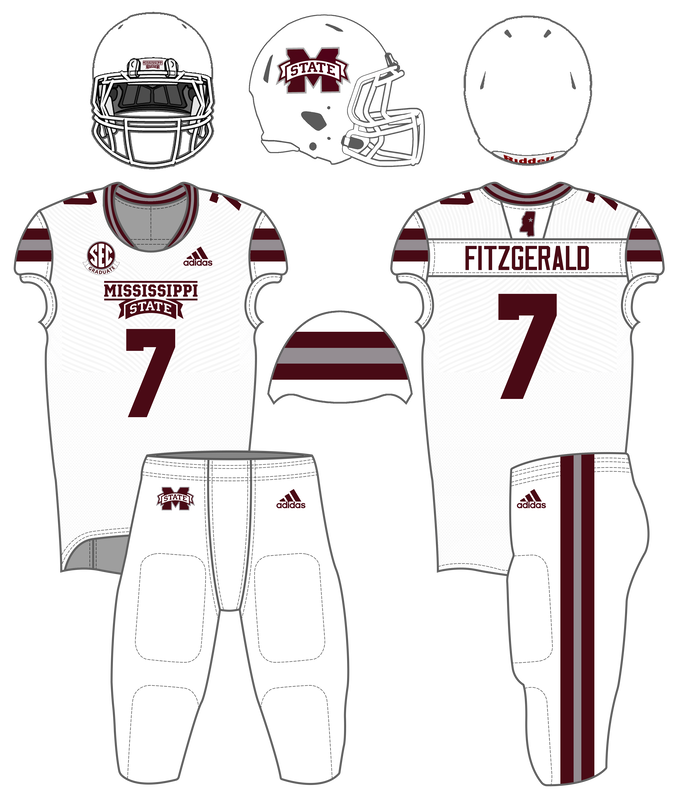 Several small changes (Maroon, White) were made, however, as the Bulldogs transitioned to Adidas's newest "Primeknit" template. Notable changes included the helmet logo, removal of shoulder numbers (a mistake that was corrected after the first three games),and the modification of the sleeve stripes and pants logo. 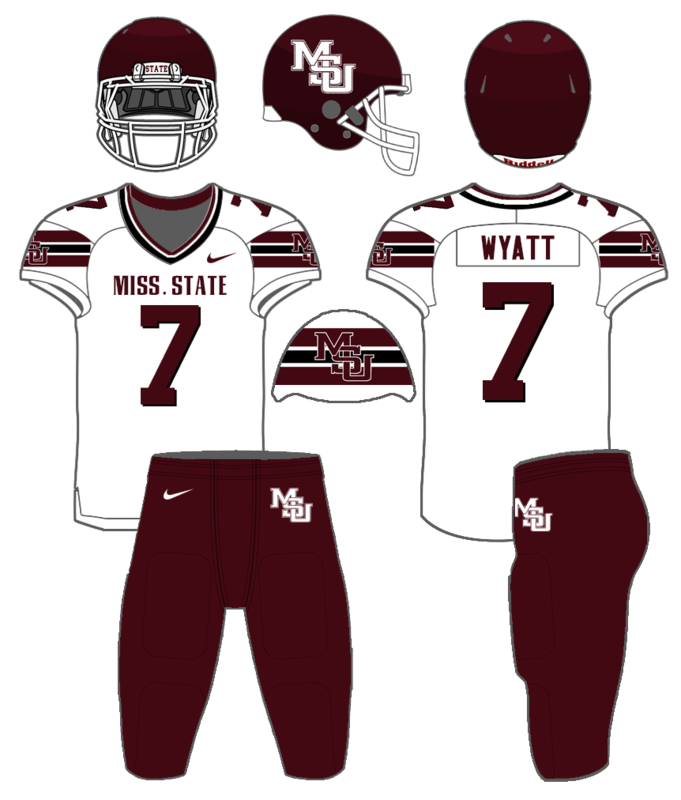 Maroon pants, also bearing the oversized pants logo, were added. Throughout 2015, several alternate uniform elements were added. Gray pants, with stripes resembling those worn in the '80s, were worn. A black alternate was worn for the first time since 2011. A white helmet was worn for the first time since 2012, and the first time with a version of the M-State logo on it since the Croom Era ended in 2008. 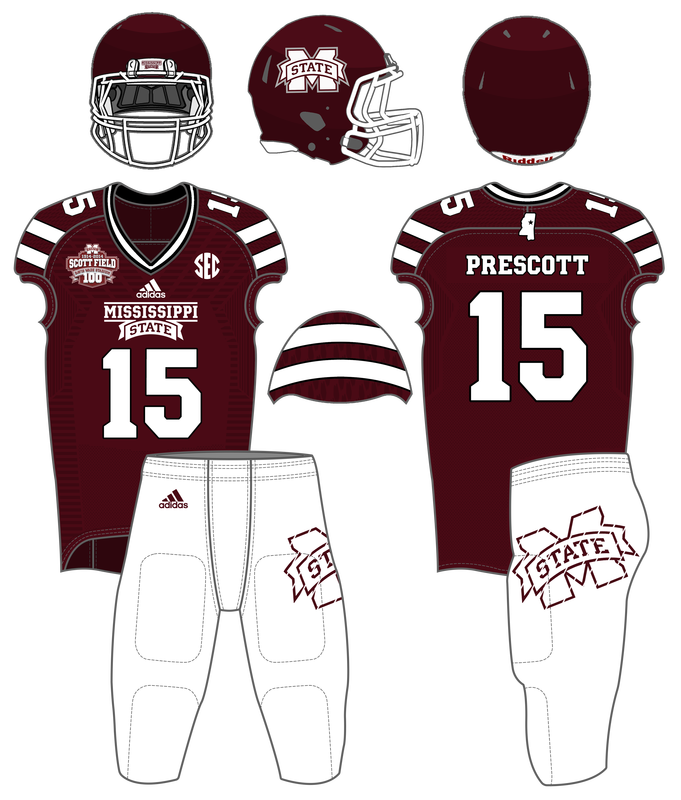 The white helmet was worn with the maroon jersey in the Egg Bowl that year instead of a gold-accented alternate. 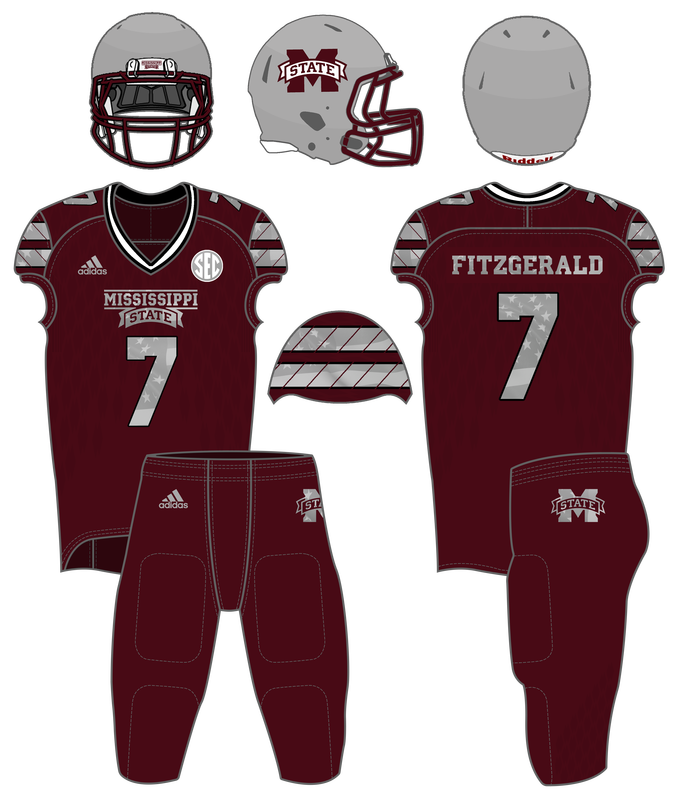 In 2016, the Bulldogs made some big improvements to the white jerseys and pants, removing the black outlines and oversized logo; they were replaced with maroon-gray-maroon stripes. 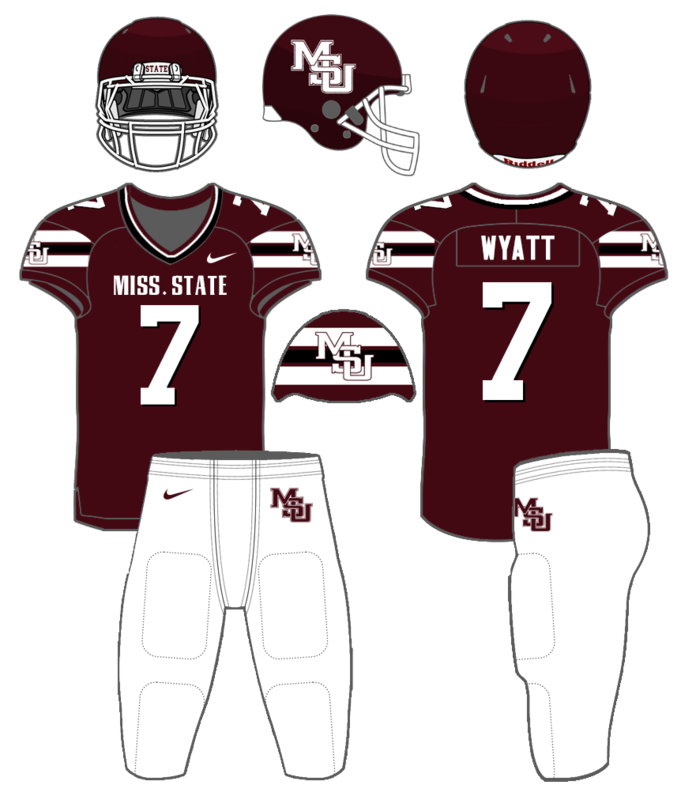 The maroon pants were also updated to feature white-gray-white stripes. Alternates in 2016 included Patriots-style alternate uniforms for the game vs UMass in Gillette Stadium and a templated Adidas American flag design for a blackout upset of #4 Texas A&M. Silver helmets, for the first time in Mississippi State history, were worn with both alternates and two other times in 2016. 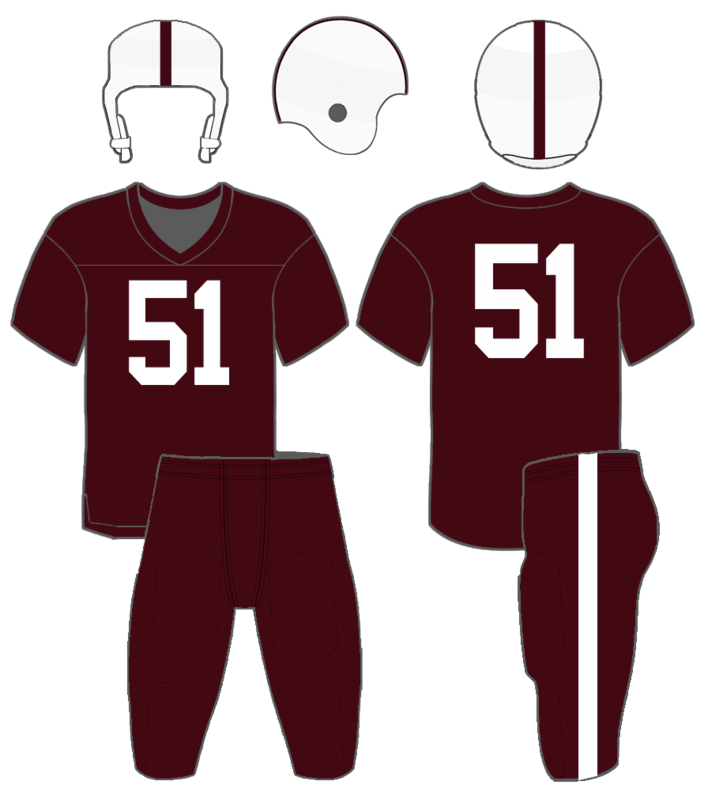 In 2017, the maroon jerseys were brought in line with the white jerseys and all of the pants; black was removed from the collar and white-gray-white stripes replaced the double white stripes with black outlines. The black jerseys and pants from 2015 were brought back in 2017 and paired with the silver helmets for the UMass game. 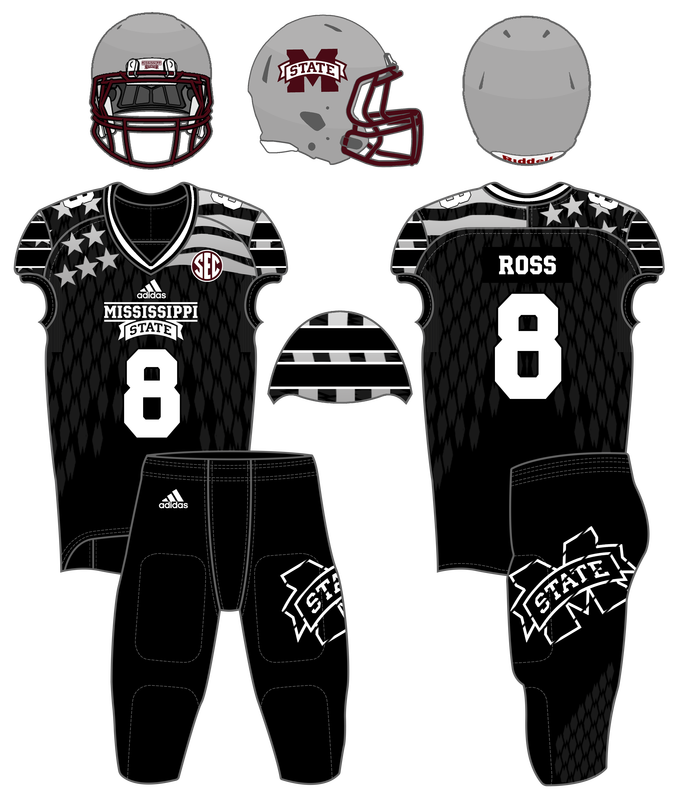 The following week, the Bulldogs wore Veterans Day alternates against Alabama, also with the silver helmets. 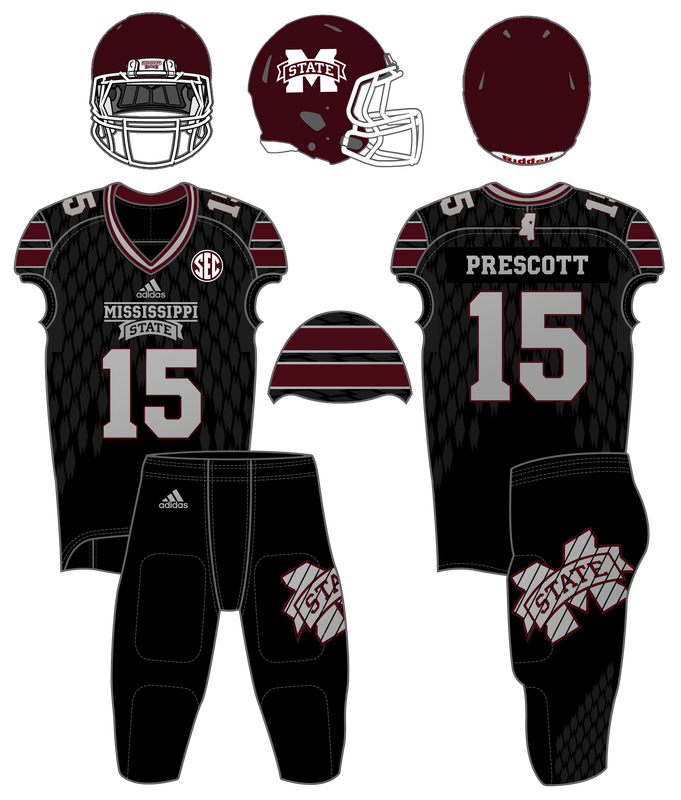 In Joe Moorhead's first season as Head Coach, Mississippi State saw some slight upgrades to its uniforms via the Adidas PrimeKnit A1 Template. A few changes were made to the primary jerseys and pants, including moving logos/patches around, adding collar stripes, and thinning pants stripes. Two jerseys (Maroon, White) and three pants (Maroon, White, Gray) were included in the 2018 set. Four helmet designs were worn in 2018: shiny maroon, matte maroon, white, and silver-based "Statesman." The shiny maroon helmets, worn only in the season opener, featured a maroon "M-State" decal rather than the white one worn the previous three seasons; the white helmets were the exact same as the ones worn since 2015. 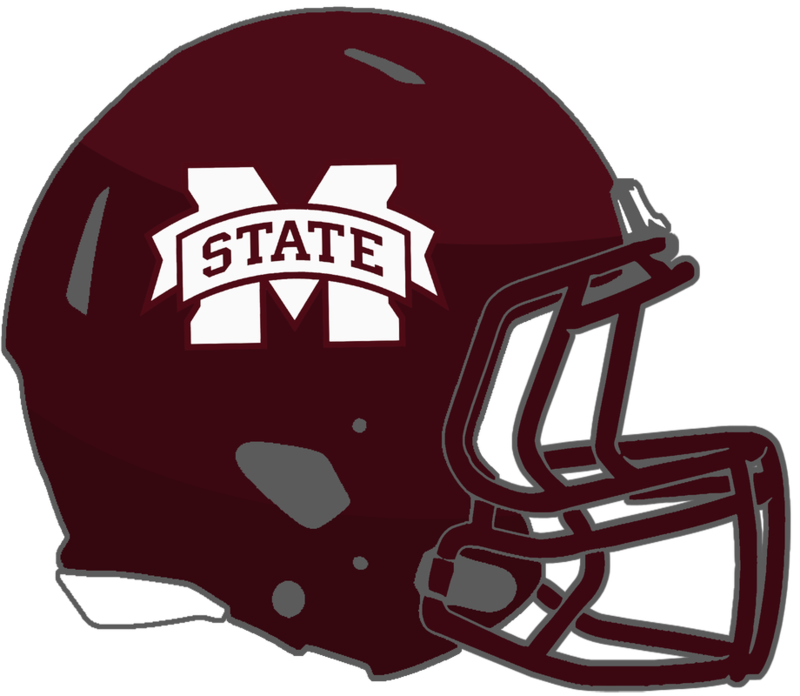 The matte maroon helmets, the first worn by State since 2015, were a very dark maroon, with a silver facesmask, silver stripe, and maroon and silver "M-State" logo. 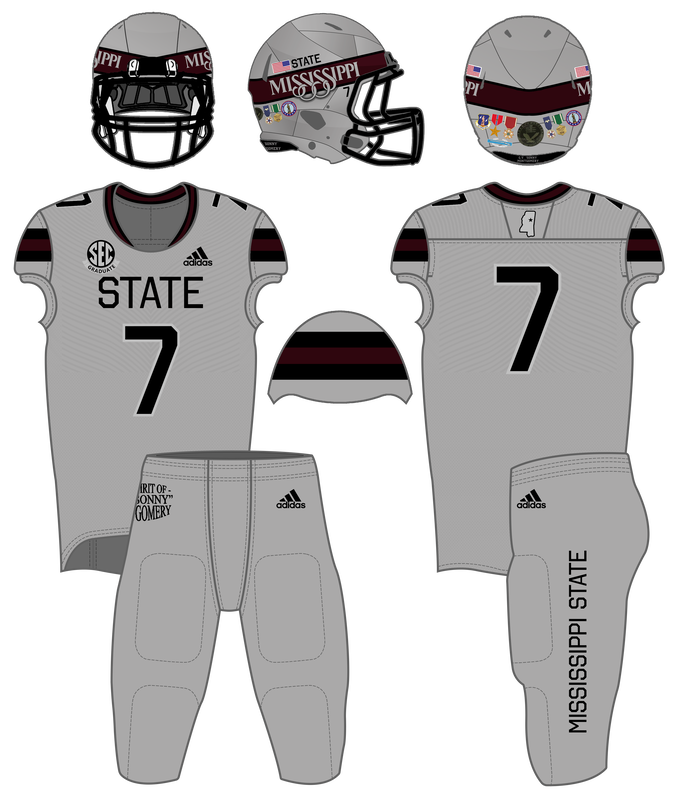 The "Statesman" helmets were part of State's 2018 alternate uniforms; the program's first ever all-gray uniforms had black-maroon-black sleeve stripes, black numbers, and a block "State" on the chest. 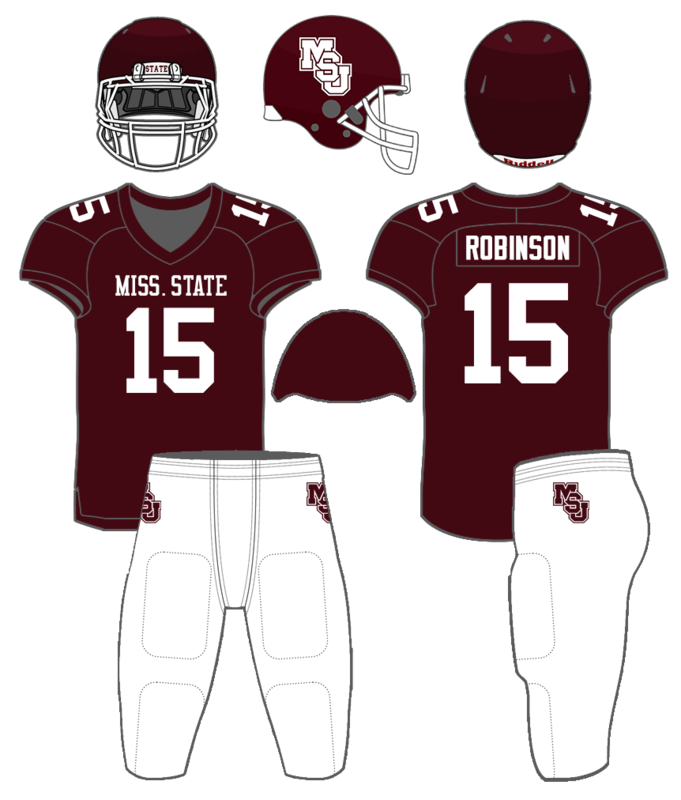 For Mississippi State's bowl game uniform history, click here. 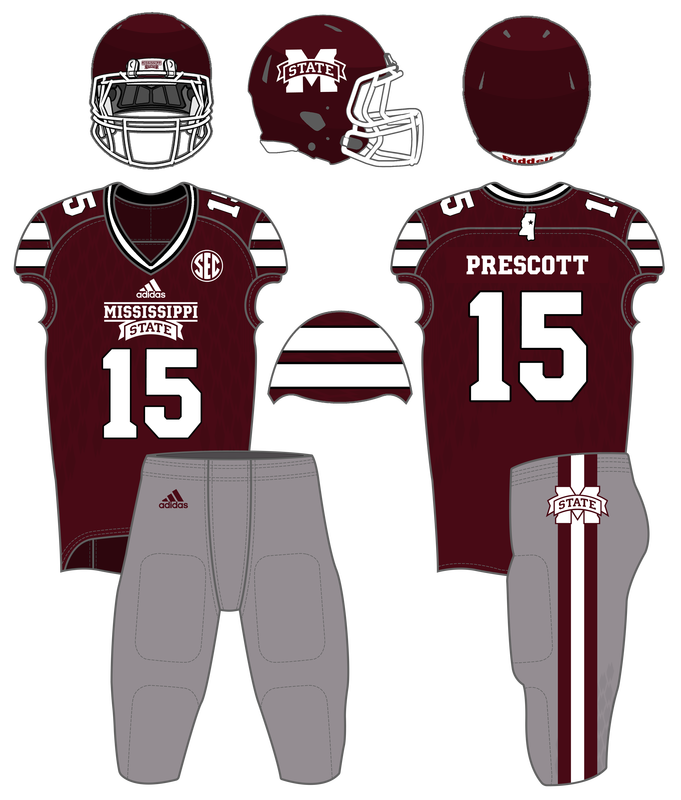 ​For Egg Bowl uniform history graphics, click here. 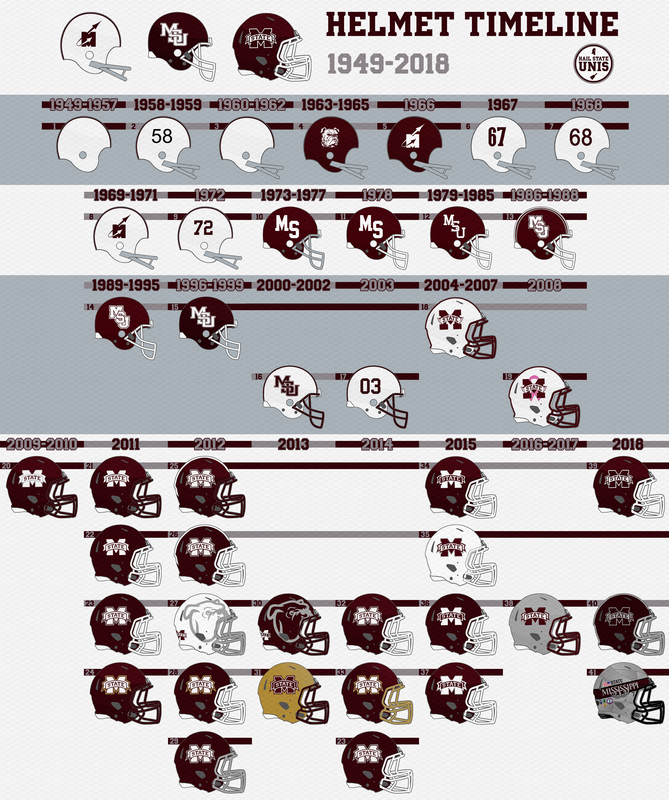 For graphics showing Mississippi State's uniform history against different opponents, click here. 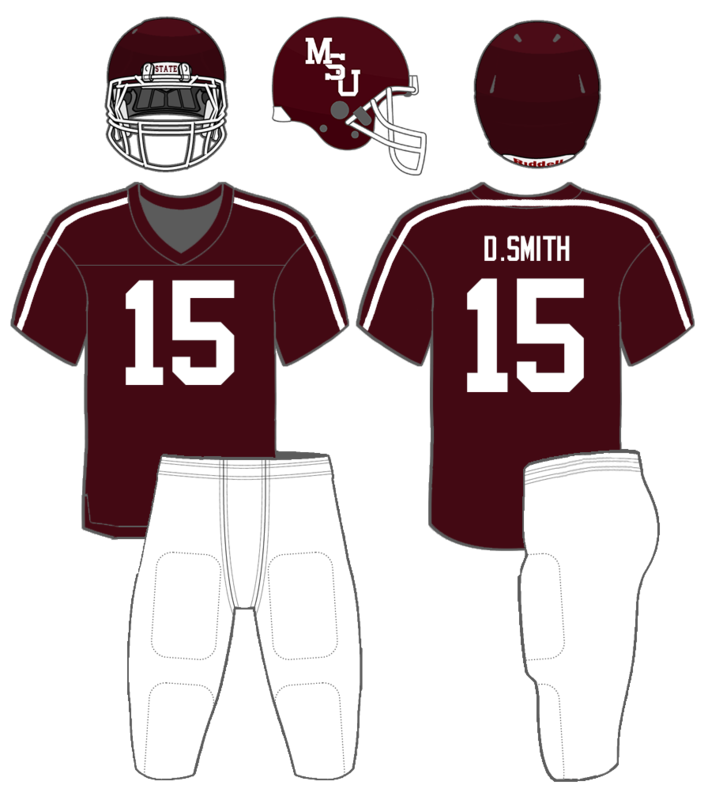 For graphics showing Mississippi State's uniform history in special uniform elements, click here.